Amylulita says...: Buzzing for Persephone's Bees Highline Ballroom Show Thurs, June 17th! Buzzing for Persephone's Bees Highline Ballroom Show Thurs, June 17th! 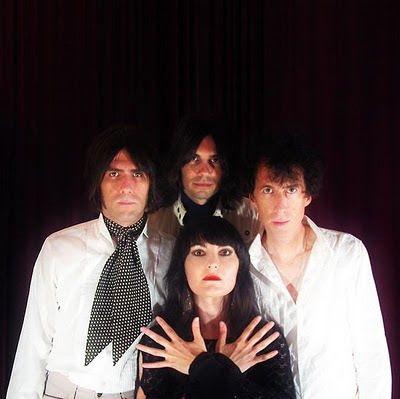 Persephone's Bees is an Oakland-based rock/pop group who caught my ears back in 2006 w/ the songs "Nice Day" and "City of Love". I fell in love w/ their look and sound, but to this day haven't had a chance to see them live! On Thurs, June 17th they are performing at Highline Ballroom and I can't wait! Something else about this band that gets my heart thumping is that the singer; Angelina Moysov also sings in Russian (she grew up in Pyatigorsk, Russia and immigrated to America in 1993) - "Muzika Dlya Fil'ma", "Little Boxes", and "Nostalgia". Some songs have gained popularity through TV shows and commercials; "City Of Love" was in the film Bewitched, "Nice Day" is used in a Hilton Hotels TV commercial for the Hilton Hotels and the Nancy Drew movie, and Angelina's vocal was used in the opening titles soundtrack of the Showtime show Weeds. Watch the two music videos below and you'll notice that they both go hand in hand to form a short story. loves it!